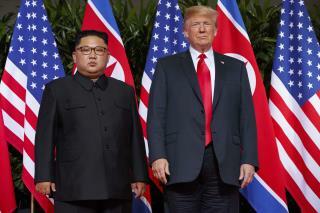 (Newser) – President Trump is about to dredge up what the Guardian says was a "low point" in his relationship with Kim Jong Un, but this time around as a wry attempt to suggest "no harm, no foul" to the North Korean leader. At least, that's what appears to be the reason behind a gift Trump is reportedly giving Kim, to be delivered via Secretary of State Mike Pompeo while he's in North Korea this week: a CD with Elton John's song "Rocket Man," per the Chosun Ilbo's sources. Late last year, Trump often referred to Kim—and not in a complimentary way—as "Rocket Man" or "Little Rocket Man" in tweets and speeches, leading Kim to fire back that Trump was a "mentally deranged US dotard." Typical Trump. Give Un a CD of “Rocketman” and Donnie signs it. we all wish his brain was connected to his mouth. it is brilliant to insult a person then show him why it is a insult then send him autographed memorabilia of said insult, this guy and his followers have to be the dumbest muther effers on gods green earth.